Glutathione is body’s own antioxidant which is critical for optimum health of every cell. It’s often referred as the master antioxidant as it is essential for healthy immune function, detoxification and skin health. Glutathione levels in body decline with age and hence supplementing Glutathione orally is important to ensure healthy aging. Glutathione imparts skin lightening and anti-aging benefits as well. It works by encouraging production of lighter melanin pigment (pheomelanin) over its darker counterpart (eumalanin). Orally consumed Glutathione effectively lightens the skin and its regular consumption also helps to boost immunity, stamina and detoxification. The ingredients in Glutone 1000 are FDA, FSSAI & ANAB approved. Q : Is this tablet vegetarian? A : Sorry, I don't know. A : Yes it is..
A : Yes! After taking tablet keep gap between Breakfast & Tea. A : Yes, it is. You can see it on the carton box itself. A : First day u feel constipation second day u will feel ok.
A : As of now I haven’t noticed any, though i am using it since 20 days only. I guess I would re-answer your question again after a month or two. Also I would like to stress that each one’s anatomy is different and hence what applies to me may not necessarily apply to you. A : No side effects. Its a good product. A : It's too early for me to say anything about this product. A : No its dosen’t have any side effect it is safe to use... and its a supplement without any Sideeffect ...! A : No no side effects. A : Glutathione tablets are considered safe as they hardly have any side effects as compared to the the injectable forms . Long term use can cause Zinc deficiency which can be easily counteracted by taking Zinc supplements (only if required). And as its a superoxide, it has other benefits of being cardio protective and immunity booster .Although glutathione is not approved by FDA for skin whitening treatment but it has been safely used in Asian countries from years . Indeed my family members use glutathione tablets with good results . Q : Is it safe to use Glutone 1000 for lactating woman? My baby is 5 months old. Can I use it? A : NO. There is no research substantiating this. But even doctors give advice to NOT take this tablet to be on safer side. A : The manufacturing co.itself states that glutone shouldn't be consumed by a pregnant or an lactating women.But in any case you can consult a doctor for further assistance..else I wont recommend it for pregnant womens or lactating mother's . A : NO. There is no research document substantiating that it is harmful. But even doctors give advice to lactating mothers to NOT take this tablet to be on safer side. A : Yeah.. it is safe. So don't worry . A : Yes why not. Glutathione is antioxidants. It is just a supplement not medicine. U can take it just like any other supplement. Consult a Doctor first. A : No, this product should not be used by pregnant and lactating women. A : Don’t use it. Baby should be at least 6 months old after which breastfeeding to the baby is optional. A : There has been no solid researches on glutathione intake during pregnancy or lactation . In such cases, these kind of products are not advised as it can result in unexpected complications. And high dose of antioxidants can interfere with development of the baby and hormone production in mother . So glutathione should be definitely avoided... If you still want to take skin lightening supplements , you can talk to a dermatologist and few supplements like NAC can be advised which increases the production of glutathione in your own body . Q : Can you please advise how to take this after breakfast or before breakfast? A : As far I have researched and learned it should be taken empty stomach ..I do take empty stomach atleast half hour before breakfast. A : It should be taken on an emty stomach, so the advice is before breakfast. A : Before breakfast, you should dissolve 1Glutone tablet and 1EnerC1000 tablet in 1 glass normal temperature water for atleast 60 days to see effect, that’s what I have been told. A : It is advised to take Glutone with Vitamin C effervescent tablet(for better results) in 200 ml of water, preferably empty stomach. So it will be better if it’s taken half an hour before breakfast . But there’s no hard and fast rule to it. You can take the supplements based on your comfort . Q : Do I have to get a blood test done? A : No, which test? pls reply..
A : No.. I dont think you have to get a blood test done..
A : In oral form of Glutathione, usually no investigations are required as compared to the injectable forms before starting the therapy unless you have a pre existing liver problem. If you are a healthy individual with normal liver function, you need not to get any tests done. The therapy can be taken safely. A : Not required... Safe product. A : It's not mandatory unless you have some health issues. A : Hello. I’m Doctor for skin asthetic. If you going to take glutone, then no need to check blood. And this tablet give good results but should take with vit c. And at least for 6 month. Then you will get good results. Q : Can Feeding mother can take glutone and vit c tablets, is it safe for mother and baby? I have 9 month baby, so I please and request for all to reply. A : No not to be use by nursing women.Its written on the product. A : I will suggest not to take. A : No its not for you baby mother. Its not for safe feeding mother..
A : I would Suggest to go for doctors recommendation. There are some acids which create internal too. But how it will affect on 9 months baby. It’s a risk. So I personally suggest you to go with doctors recommendation. A : No! You can take after few months when you stop feeding your baby. A : NO. BREAST FEEDING MOTHERS SHOULD NOT TAKE SUCH TABLETS. BUT IF YOU ARE NOT BREAST FEEDING THAN YOU CAN TAKE THE TABLETS. A : Glutone is a superoxide which can interfere with growth of the baby .As such no studies are conducted on breastfed babies but it is advised to avoid glutathione during breastfeeding. A : No it's not.. You can take it when u stop feeding your child. Q : If I stop this product after some time, what will happen? Is this a life time process? How many days I have to use this product? A : May not answer this question because I took it only for 15 days as of now. A : U have to use it regularly and stop it when u get the result n start taking the maintenance dose as the effects aren’t permanent so use a proper sunscreen. A : You have to use it for atleast 3 months to get visible results... And then you can stop ....but you have to restart after six months... Because results will fade away after 6 months..
A : i have been used 11 tab only as of now. A : It is not a permanent change and needs to be stopped after 3 months and then given a miss for 2 months and then trusted if deemed necessary... Can be taken continuously for 3 months... Then consult dermatologist for further intake. A : It’s not for life time process. Atlest 90 days you should use this product and stop for few months then again you can start. As well you should be using sunscreen lotion - Always - Whenever you are in sun contact. A : If u stop use this product nothing will happen. Use for 4 to 5 months for better result. A : If one stops glutathione, the skin complexion and glow will come back to the original state in a couple of months. One has to understand that there is no permanent skin lightening method available . One has to be on the maintainance therapy to retain the benefits of glutathione . To get appreciable results , atleast 3 months of oral therapy is required . As its in oral form, it takes time to show results . There’s also an important point to be noted that the skin tone improves by 1-2 shades only . On addition , it has cardioprotective , immunity boosting properties and also provides an even tone to the skin with glow. Q : Do I have to use this product for lifetime?? A : Not at all...as per my knowledge use it for 2-3 months until u get ur desired complexion....not more than 3 months. A : The results (if seen) will last as long as you take the tablets. I don’t recommend taking it life long. A : Ideally for glutathione to work, you should consume it regularly for atleast 3 to 4 months. A : Hii I think we will have to continue till desire results and after that for the maintenance we can reduce its dose with 500 mg in a day or later 3 days in a week. .
A : No... You should use it for 3 months and stop.. Further treatment should be under supervision of dermatologist. Q : Is this product available only in india? A : I m not sure about that! Though it’s marketed in India. A : Well all I know that I got it from India but I'm sure it must be available outside as well.Perhaps Micheal Jackson must have used the same to lighten his complexion ,who know????? .This product is giving obvious results now so I happy to continue. Please be patient and you will see the difference unfold. A : I believe you can buy it overseas as well. A : I used the tablet just 17 days ago, I heard that result we will see after 3-4 months. Let's see..
A : It is available in India and not sure about other countries. Q : can we take Vitamin C with these tablets..?? A : You have to take vitamin C with this. A : Yes... for best results we should take. A : Yes it's vital to take vitamin c tablets aling with Glutathione for better absorption of the same and consequently the effects are obvious. Please take both dispersible tablets for best results. Hope this satisfies your query. A : In my opinion...Yes..! Vitamin C is an antioxidant and therefore has its own skin lightening effect ..
A : Yes definitely.. infact glutone 1000 will give you best results if you will use it with ener c 1000 . A : It is Vitamin C that will make you fair. Glutathione will only help in absorbing vitamin c and sustain it in your body for a longer time. So without vitamin C, glutone 1000 is worthless. Also due to Glutone 1000 your body goes in a state of Zinc deficiency. So you must prefer Escor-Z as it contains Vitamin C + Zinc. Q : Does it give permanent result? I want permanent fairness. Please help me. A : It will take 4 months to get 3 shades lighter, after 4 months you have to use Glutone 500 OR Glutone C to maintain. If you stop using it your color will go down to 2 shades after 3 months. A : Good product it works. A : Don't know... but its not harmful... i think if u use it regularly with proper instruction u may get the results..
A : Its been 1 week for having tablets and i can see the results. u must try...!!! A : Am not sure about the permanent fairness. i have used only for a month now. so i haven't seen results so far. A : I'm not sure for permanent result. But it depends on your self mantain and for more and better result contact your dermatologist. A : There are no products in the market which can give you permanent skin lightening effects. It takes 3-4 months of regular use of this product to see considerable results. One has to keep taking these tablets for maintenance too. Once you stop taking these tablets, the skin will come back to its previous state in 1-2 months. It is advisable to take these tablets with effervescent Vitamin tablets (1000mg/day) for better results. Q : I am suffering from pigmentation. I mean on my fore head and cheeks having black patches. Can i use this? A : I have also got the same problem and for the same purpose I have started consuming these tablets of Glutone 1000 since 1 last month.Though the fingers and hands are gradually losing pigmentation but still on face I do not see difference in pigmentation. For that Lipoic acid and zinc should be added with Glutathione in the tablet for better result. A : Yes u can use this product to reduce pigmentation and patches. A : It will definitely cure your pigmentation however you have to use it for at least 3-4 months along with better sun protection. A : I don't think that. But it all depends upon ur body and results comes out atleast after a month with proper usage n instructions how to take the gluta n ener C.
A : It would take a month for you to see the results.If you take a proper dosage with vitamin c you will see the result quickly. A : No ...Glutathione in tablet form requires atleast 3 months to show appreciable results as compared to the injectable form. A : Yes definitely in 15 to 20 days u can get the little results but not 100 percent, but remember always take it with vit - c 1000 mg or ener- c and must apply good quality of spf whether you are at home or outside. A : Am taking it from last 10 days and i found little changes. A : You can see visible difference only after 3 months. However, you can see a change in the skin's texture and radiance. Q : Does it have any side effects after long years? Especially for girls... In their pregnancy? A : No no side effects dont worry about this product its great antioxidant so chill.. please avoid if you are pregnant.. this is not for feeding mothers..
A : Taking glutathione long-term has been linked to lower zinc levels.you can take zinc suppliments. A : I am not a girl and hence cannot answer ur question. It is recommended to consult a doctor in such a case. A : Girls who are pregnant should not take it unless consulting with their gynaecologist...in normal circumstances it is very safe. A : No but do'nt use it in pregnancy time. A : Glutone, as you are aware offers, the world's best source of Glutathione, which is, SETRIA Glutathione from Kyowa Hakko, Japan. In Feb 2018, SETRIA has attained GRAS status from US FDA. GRAS status means, 'Generally Recognised As Safe'. Hence, it is expected that, when SETRIA Glutathione used in the recommended dosages for skin lightening, the product is safe for long term use. However, clinical studies of Glutathione for skin lightening have been done for duration of 12 weeks with good safety profile of Glutathione and other studies to determine blood levels for 6 months have also reported excellent safety. As regards use in Pregnancy, there has been no study done using Glutathione in Pregnant Women. Not enough information is available to determine if glutathione is safe to use during pregnancy and breastfeeding. Hence, it is advisable to always discuss this with your Doctor who will weigh the risk vs benefits and make a decision. Q : What we should avoid to eat when we are having this tablet? A : There is nothing as such that you are needed to cut off from your diet.What I do is only to take it on empty stomach every morning that means there should be atleast half hour gap before your breakfast. A : I dont know about this. Because i m personally not avoiding anything. About to complete 1 month. And m getting results. M happy bt its expensive. A : Nothing its totally safe..
A : I dont hv any knowledge about this.i am on my normal regular diet. A : The tablet works well if you take it on empty stomach or with the time difference of two hours before or after meal. A : Well if you need quick results then it is advisable to eat healthy food. It is our poor lifestyle that results in poor skin conditions. Avoid spicy food, sugar, oily food and eat only home-cooked cuisines. Add a salad to all your meals as raw vegetables have more nutrition than processed food. Also, drink lots of water. Q : Can i consume glutone 1000 tablet in hot water? It is before food or after food? I am drinking vegetables juice so can i continue after taking Tablets? And in the night i take Red wine is there any side effects from this tablet? A : It really doesn't matters even if you take this tablet with hot or luke warm water. However you must have it on empty stomach, preferredly in the morning, and you cannot eat or drink juices or wine for at least an hour after that glothione dose. Drinking red wine has nothing to do with this tablet. A : Not hot water but Luke warm water can be considered. It has to be consumed in the morning, empty stomach. Ya.. you can have the supplement first in empty stomach and then after a gap of 30 mins, you can have your vegetable juice. It's better if you pause the intake of red wine for a period when you're having these supplements. Good luck. A : No ,you consume glutone 1000 tablet in normal water.its before food only one tablet in a day .yes it's vegetables tablet ..its not a tablet its supplement without side effect it's safe ..
A : Please take only with vitamin C only..
A : i take it in normal water which is neither hot nor cold in empty stomach in the morning. can drink vegetable juice or redwine like 30mins after drinking glutone. A : Vitamin C with 500 mg to 700mg is enough. A : With glutone 1000 and ener c 1000 I think more effective. A : Ener C should be taken with glutone 1000, escor Z should be taken with gluton C.
A : Anyone is fine but for better results go for Escor-z. Q : How to use this one , and can i drink it when i am menstruating ? A : Yes! It has to be taken everyday empty stomach dissolved in 120 ml of water with 1000mg of vitC, irrespective of your menstrual cycle phases. A : Mix with vitamin C ,Ener C tablet both in one glass of water and have it after breakfast... You can use during menses. A : You just have to dissolve a tablet in a glass of water along with the vitamin-C tablet and drink it empty stomach.It is completely safe to drink it during the menses as I've been doing so and haven't faced any problem. A : 1 glutathione &1 vitamin c tab drop in 100ml water wait till effervescent dissolve completely with 2 min than drink. note- please take empty stomach at morning. please dont take if you are pregnant or feeding mother. Q : How to maintain it for long time effect? and how much dose required for maintain it? A : It depends person to person. For its maintenance you should use a good sunscreen. A : Hey m a as new as u r, to dese tablets. It’s been 15 days precisely, I have been taking a dose of these tablets. I ll have to wait for another 15 days perhaps, to see any visible effects. So only after a dosage of a month or visible effects, whichever is earlier, I believe I might be able to help wid an appropriate answer. A : You will have to take this for at least for 4 months along with vitamin c. For good result and maintenance avoid sun exposure, use a good quality sunblock. You can also take oral sunscreen for better results. A : By using sunscreen and avoiding sun exposure. A : You need to take glutone 500 tab after 4 month use of glutone 1000. And need to use sunscreen. Sunscreen is very important to maintain the effect. A : You need to use it for minimum 3 months and then maintaining soon after. There are no visible side effects. Q : Are Glutone tablets better and safer than Gluthathione Injections? A : When used, as per dosage advised, both oral and injectable route of administration of Glutone are effective. Tablets are very simple and convenient to use and we have Glutone in a range of dosage to meet different skin tone needs. Injectable form gives higher levels in the blood and can cause local reactions at the site of administration. You can discuss with your medical practitioner as to which form is suitable for you. Thank you for your interest and support for Glutone. A : Glutathione injection has quicker result as it mixes with the blood directly but one cannot have injection daily as it has got very dreadful side effect as thrombosis which is very risky and one has to be very alert as there are many fake glutathione injections running in the market.So Glutathione tablets are obviously safer and easy to consume without having any risk. Q : If I quit after 2-3 months then what would be the effect? A : It depends on how you take care of yourself. You must use sunscreen everyday and avoid sun tan. A : The effect will start diminishing. Atleast 3-4 months of constant consumption is required, post which u shud go into maintenance mode by consuming glutone 500 and using effective sunscreen products. A : It may not have any effect even if you quit, provided you take good care by using sunscreen lotion. Q : With Glutone, will my whole body have skin lightening effects or only my face? A : With Glutone, you will experience skin lightening effect all over the body, with continued use as suggested. In Glutone, we are providing ‘SETRIA GLUTATHIONE’, from the world’s No.1 source of Glutathione, which is, Kyowa Hakko, Japan. It is recommended that, depending on your skin tone, you begin therapy with either Glutone 500 or Glutone 1000 and continue to take the product, in the dosage of 1 tablet daily for atleast 12 weeks. With this course of treatment, you will see a visible difference all over the body, from around from 4 weeks, which will continue as your treatment progresses. Thank you for your interest and support for Glutone. A : It will effect on whole body not only on your face. Even it’s start affecting the body first then to your face. A : Result is more on the body...but not much on my face. A : Whole body. But you have to be very patient to see the results. A : yes..u will definately notice results in 15days.. best product for skin lightening though it is costly but results are 100%..i highy recommend to use this product..
Q : I am taking half of Glutone 1000 tablet (500mg) with Ener C 1000 twice daily 2 hours prior to meal. Will it work? Or should I take 1000 mg Glutone with 1000 mg Ener C 1000 every morning on empty stomach? A : Take 1000mg glutone with 1000mg energy C every morning on empty stomach. A : In order to get the whitening effect it is always recommended to take 1000mg glutone with 1000mg ener C in the empty stomach. After 4 months you can cut down your dosage to 500mg to maintain those results. A : Ye you have to take both glutathione+vitamin c.
A : Yes, because qlutone work in combination of vitamin c. Without vitamin c it wont work. Q : What is the bio-availability? A : the proportion of a drug or other substance which enters the circulation when introduced into the body and so is able to have an active effect. A : Glutathione is produced in a limited manner by the body... Hence we need to take the external dose to get good effects fast..
A : I don’t know the packet doesn’t mention about it and also on google some studies say that oral glutathione gets absorbed but nobody mentions about how much percentage. A : I am using this and I don't know bio availability. Q : Can i have this with hot water? I like hot water, so can i drink it with hot water instead of normal one? A : Use room temperature water. It doesn't have to be hot or cold. A : No it has to taken with room temp water. A : According to me use normal warm water ..
Q : I have vitiligo(white patches) on my back and on lips. Can I use this product? A : I received the products.. And it is very good packaging which I received .. Is this for my first time to use.. Hope soo.. It will good for me.. Thats why i'll buy it again.. For further fantastic result. Thanku all once again. Stay blessed. A : Vitiligo is caused due to destruction of the pigment forming cells in the skin . Glutathione cannot help in the cases of Vitiligo . It just reduces the pigment production to an extent without affecting pigmentory cells . There are phototherapy treatments available for Vitiligo which are really effective .You can consult a dermatologist and look into the options . Q : I'm 15 years old. can i use this? A : No! It is recommended for 18 years and above only. Q : As compared to other Glutathione brand why is Glutone Tablet so costly? 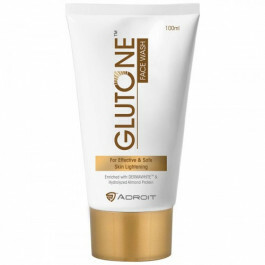 A : Glutone is the only Glutathione brand in India to offer, ‘SETRIA GLUTATHIONE’, from the world’s No.1 source of Glutathione, which is, Kyowa Hakko, Japan. Besides offering the best source of Glutathione, Glutone is available in the widest range of - tablets, effervescent tablets and even in injectable form. Manufacturing of effervescent tablets requires special manufacturing facilities with controlled temperature and humidity conditions. Even the packaging for these effervescent tablets is unique with special tubes fitted with dessicant containing stoppers or caps that maintains the product quality. You will appreciate that to get such a product of international quality, we will be incurring some additional costs. Nevertheless, be rest assured that we are giving you the best quality Glutathione for unmatched efficacy and safety in Glutone. Thank you for your interest and support for Glutone. A : It's not costly! Compare with the other brands authentic dermatologists prescribe like epilight advance 1000mg; glutone has the almost the same price or lower! Secondly, it's an effervescent tablet, any effervescent tablet you'll find in the market costs more than the regular one's. Q : How many days for it to start working? A : It takes atleast 15-20 days to notice changes. Skin lightening usually starts from feet towards head. Atleast 3-4 months of everyday use is advised to see the proper results . The results are not permanent . It will fade away in a month of stoppage of the supplements . So regular use is advised . Q : How much time will it take for whitening? A : I have no idea. Probably 2-3 months. A : You'll start seeing the results after 15-16 days from fingers of your legs. A : Using it since last one month, still didn't got any results. Let see going to use it for 2 months more. Q : Do i need to get myself tested before start taking glutathione? I mean any type of laboratory test? Q : Do we need to use ener c or escor z along with this? If yes which to use and what is the difference? A : Using of ener C is recommended Because, glutathione by itself cannot be absorbed into your system. And the best result can be obtained only when it is consumed in conjunction with vitamin C of any type. A : Ener c has only vitamin c and ener z has vitamin c and zinc .... When we eat gluton glutathione we have deficiency of zinc so it is necessary to take zinc supplement along with gluton..
Q : This tablet is taken by dissolving in water right, So along with this can we have any brand of vitamin C tablet which can take without dissolving in water? Or we should take vitamin C also which dissolves in water? A : Yes there are many brands of Vit C tablets like Limcee and C ZIN which can be consumed without dissolving in water but dissolved tablet can be absorbed better by the body. A : U can take EnerC1000mg / Escor Z which are Vitamin C water soluble tablets..
Q : I have been using the tablets from last 15 days, again I have ordered a pack of 2, so as per the doses after almost 3 months should it be stoped consuming or it has to be maintained by Glutathione C, if yes for how long glutathione C has to be consumed. Q : Is this pack is only for 15 days? Then for 3 months do we need to buy 6 bottles? Q : As compare to other Glutathione brand why these tablates are so costly. Means Rs 2398 for 15 tablets? A : Glutone 1000 contains the world's best Glutathione and is 100%pure (Setria Glutathione). Best things always cost high and is 100% effective! Q : what is the difference between GLUTONE C and GLUTONE 1000 ? A : Glutone C had 500mg glutathione with 1000mg vitamin C in each tablet. Glutone 1000 has 1000mg of glutathione with a 60mg vitamin C.
Q : this is only for vegetarians ? A : No, anyone can use this. A : If you're asking that tablets are for vegetarians then yes as you can see the green mark on the packet which indicates that the product is vegetarian. Q : How many days do I have to use this? A : A minimum of 3-4 months is required to get the desired results. Also, It is recommended to use oral sunscreen or external sunscreen to protect you from the UV rays. Q : For how long do I have to take these tablets? A : The dueration of course is of minimum 2 months. Q : Do you also sell any Oral Sunscreen? Q : If I only take Glutone 1000 and not EnerC 1000 will i still get results? A : No, Its the comination of both the products which does the magic of your skin whitening. Q : Isko lene se face gora hota hai ya puri body? A : The whitening will start from your hands and legs and fir centralized hoke puri body gora karegi. Q : Can you deliver this product in Nepal? Q : Are they better and effective than the Glutathione Injections? A : These tablets are Dispersable and hence it is easy to have them as they mix with the water and all you have to do is gulp it down and omn the other hand for Iv's you have to go to a doctor, get done a proper check up and all of that... So according to me these water soluble tablets are far better then injections. Q : Ky ye sach me kam karta hai????? A : Me isko 3.5 month se use kar raha hun, meko tho change deekha, han magar apko Sunscreen ka use karna padega kyunki tanning se phir se apki skin dark hojayegi. So ap Oscreen ka use karoo vo kafi effective hai. Q : Do tablets contain sugar? Also has it been certified as safe by government for usage? A : Please consult a dermatologist and then start the treatment. Q : Can we use this tablet while breastfeeding? Q : Does this product have any Side Effects? Q : Hi its only glutone tab or including vitamin c tab also? Q : If we stop taking the tablets than it stops working on fairer process?? Q : Is this permanent result..? Or we have to use it life long..? Q : To take this tablets our minimum age? Q : Hello, I am from United Kingdom. Please kindly tell me what is price this products in my country. I want to buy these tablets as my friends ordered last time from you. Product has great affects on my skin. Please help me with shipping. As compare to other Glutathione brand why these tablates are so costly. Means Rs 2398 for 15 tablets? Glutone 1000 contains the world's best Glutathione and is 100%pure (Setria Glutathione). Best things always cost high and is 100% effective! How many days do I have to use this? A minimum of 3-4 months is required to get the desired results. Also, It is recommended to use oral sunscreen or external sunscreen to protect you from the UV rays. How many days for it to start working? It takes atleast 15-20 days to notice changes. Skin lightening usually starts from feet towards head. Atleast 3-4 months of everyday use is advised to see the proper results . The results are not permanent . It will fade away in a month of stoppage of the supplements . So regular use is advised . How much time will it take for whitening? I have no idea. Probably 2-3 months. You'll start seeing the results after 15-16 days from fingers of your legs. Using it since last one month, still didn't got any results. Let see going to use it for 2 months more. For how long do I have to take these tablets? The dueration of course is of minimum 2 months. Do you also sell any Oral Sunscreen? If I only take Glutone 1000 and not EnerC 1000 will i still get results? No, Its the comination of both the products which does the magic of your skin whitening. Isko lene se face gora hota hai ya puri body? The whitening will start from your hands and legs and fir centralized hoke puri body gora karegi. Can you deliver this product in Nepal? Are they better and effective than the Glutathione Injections? These tablets are Dispersable and hence it is easy to have them as they mix with the water and all you have to do is gulp it down and omn the other hand for Iv's you have to go to a doctor, get done a proper check up and all of that... So according to me these water soluble tablets are far better then injections. Ky ye sach me kam karta hai????? Me isko 3.5 month se use kar raha hun, meko tho change deekha, han magar apko Sunscreen ka use karna padega kyunki tanning se phir se apki skin dark hojayegi. So ap Oscreen ka use karoo vo kafi effective hai. Does it give permanent result? I want permanent fairness. Please help me. It will take 4 months to get 3 shades lighter, after 4 months you have to use Glutone 500 OR Glutone C to maintain. If you stop using it your color will go down to 2 shades after 3 months. Don't know... but its not harmful... i think if u use it regularly with proper instruction u may get the results..
Its been 1 week for having tablets and i can see the results. u must try...!!! Am not sure about the permanent fairness. i have used only for a month now. so i haven't seen results so far. I'm not sure for permanent result. But it depends on your self mantain and for more and better result contact your dermatologist. There are no products in the market which can give you permanent skin lightening effects. It takes 3-4 months of regular use of this product to see considerable results. One has to keep taking these tablets for maintenance too. Once you stop taking these tablets, the skin will come back to its previous state in 1-2 months. It is advisable to take these tablets with effervescent Vitamin tablets (1000mg/day) for better results. If I quit after 2-3 months then what would be the effect? It depends on how you take care of yourself. You must use sunscreen everyday and avoid sun tan. The effect will start diminishing. Atleast 3-4 months of constant consumption is required, post which u shud go into maintenance mode by consuming glutone 500 and using effective sunscreen products. It may not have any effect even if you quit, provided you take good care by using sunscreen lotion. I am taking half of Glutone 1000 tablet (500mg) with Ener C 1000 twice daily 2 hours prior to meal. Will it work? Or should I take 1000 mg Glutone with 1000 mg Ener C 1000 every morning on empty stomach? Take 1000mg glutone with 1000mg energy C every morning on empty stomach. In order to get the whitening effect it is always recommended to take 1000mg glutone with 1000mg ener C in the empty stomach. After 4 months you can cut down your dosage to 500mg to maintain those results. what is the difference between GLUTONE C and GLUTONE 1000 ? Glutone C had 500mg glutathione with 1000mg vitamin C in each tablet. Glutone 1000 has 1000mg of glutathione with a 60mg vitamin C.
I have vitiligo(white patches) on my back and on lips. Can I use this product? I received the products.. And it is very good packaging which I received .. Is this for my first time to use.. Hope soo.. It will good for me.. Thats why i'll buy it again.. For further fantastic result. Thanku all once again. Stay blessed. Vitiligo is caused due to destruction of the pigment forming cells in the skin . Glutathione cannot help in the cases of Vitiligo . It just reduces the pigment production to an extent without affecting pigmentory cells . There are phototherapy treatments available for Vitiligo which are really effective .You can consult a dermatologist and look into the options . I'm 15 years old. can i use this? No! It is recommended for 18 years and above only. How to maintain it for long time effect? and how much dose required for maintain it? It depends person to person. For its maintenance you should use a good sunscreen. Hey m a as new as u r, to dese tablets. It’s been 15 days precisely, I have been taking a dose of these tablets. I ll have to wait for another 15 days perhaps, to see any visible effects. So only after a dosage of a month or visible effects, whichever is earlier, I believe I might be able to help wid an appropriate answer. You will have to take this for at least for 4 months along with vitamin c. For good result and maintenance avoid sun exposure, use a good quality sunblock. You can also take oral sunscreen for better results. By using sunscreen and avoiding sun exposure. You need to take glutone 500 tab after 4 month use of glutone 1000. And need to use sunscreen. Sunscreen is very important to maintain the effect. You need to use it for minimum 3 months and then maintaining soon after. There are no visible side effects. Is it safe to use Glutone 1000 for lactating woman? My baby is 5 months old. Can I use it? NO. There is no research substantiating this. But even doctors give advice to NOT take this tablet to be on safer side. The manufacturing co.itself states that glutone shouldn't be consumed by a pregnant or an lactating women.But in any case you can consult a doctor for further assistance..else I wont recommend it for pregnant womens or lactating mother's . NO. There is no research document substantiating that it is harmful. But even doctors give advice to lactating mothers to NOT take this tablet to be on safer side. Yeah.. it is safe. So don't worry . Yes why not. Glutathione is antioxidants. It is just a supplement not medicine. U can take it just like any other supplement. Consult a Doctor first. No, this product should not be used by pregnant and lactating women. Don’t use it. Baby should be at least 6 months old after which breastfeeding to the baby is optional. There has been no solid researches on glutathione intake during pregnancy or lactation . In such cases, these kind of products are not advised as it can result in unexpected complications. And high dose of antioxidants can interfere with development of the baby and hormone production in mother . So glutathione should be definitely avoided... If you still want to take skin lightening supplements , you can talk to a dermatologist and few supplements like NAC can be advised which increases the production of glutathione in your own body . Yes! After taking tablet keep gap between Breakfast & Tea. Yes, it is. You can see it on the carton box itself. First day u feel constipation second day u will feel ok.
As of now I haven’t noticed any, though i am using it since 20 days only. I guess I would re-answer your question again after a month or two. Also I would like to stress that each one’s anatomy is different and hence what applies to me may not necessarily apply to you. No side effects. Its a good product. It's too early for me to say anything about this product. No its dosen’t have any side effect it is safe to use... and its a supplement without any Sideeffect ...! Glutathione tablets are considered safe as they hardly have any side effects as compared to the the injectable forms . Long term use can cause Zinc deficiency which can be easily counteracted by taking Zinc supplements (only if required). And as its a superoxide, it has other benefits of being cardio protective and immunity booster .Although glutathione is not approved by FDA for skin whitening treatment but it has been safely used in Asian countries from years . Indeed my family members use glutathione tablets with good results . I don't think that. But it all depends upon ur body and results comes out atleast after a month with proper usage n instructions how to take the gluta n ener C.
It would take a month for you to see the results.If you take a proper dosage with vitamin c you will see the result quickly. No ...Glutathione in tablet form requires atleast 3 months to show appreciable results as compared to the injectable form. Yes definitely in 15 to 20 days u can get the little results but not 100 percent, but remember always take it with vit - c 1000 mg or ener- c and must apply good quality of spf whether you are at home or outside. Am taking it from last 10 days and i found little changes. You can see visible difference only after 3 months. However, you can see a change in the skin's texture and radiance. Can you please advise how to take this after breakfast or before breakfast? As far I have researched and learned it should be taken empty stomach ..I do take empty stomach atleast half hour before breakfast. It should be taken on an emty stomach, so the advice is before breakfast. Before breakfast, you should dissolve 1Glutone tablet and 1EnerC1000 tablet in 1 glass normal temperature water for atleast 60 days to see effect, that’s what I have been told. It is advised to take Glutone with Vitamin C effervescent tablet(for better results) in 200 ml of water, preferably empty stomach. So it will be better if it’s taken half an hour before breakfast . But there’s no hard and fast rule to it. You can take the supplements based on your comfort . If I stop this product after some time, what will happen? Is this a life time process? How many days I have to use this product? May not answer this question because I took it only for 15 days as of now. U have to use it regularly and stop it when u get the result n start taking the maintenance dose as the effects aren’t permanent so use a proper sunscreen. You have to use it for atleast 3 months to get visible results... And then you can stop ....but you have to restart after six months... Because results will fade away after 6 months..
i have been used 11 tab only as of now. It is not a permanent change and needs to be stopped after 3 months and then given a miss for 2 months and then trusted if deemed necessary... Can be taken continuously for 3 months... Then consult dermatologist for further intake. It’s not for life time process. Atlest 90 days you should use this product and stop for few months then again you can start. As well you should be using sunscreen lotion - Always - Whenever you are in sun contact. If u stop use this product nothing will happen. Use for 4 to 5 months for better result. If one stops glutathione, the skin complexion and glow will come back to the original state in a couple of months. One has to understand that there is no permanent skin lightening method available . One has to be on the maintainance therapy to retain the benefits of glutathione . To get appreciable results , atleast 3 months of oral therapy is required . As its in oral form, it takes time to show results . There’s also an important point to be noted that the skin tone improves by 1-2 shades only . On addition , it has cardioprotective , immunity boosting properties and also provides an even tone to the skin with glow. Do I have to get a blood test done? No, which test? pls reply..
No.. I dont think you have to get a blood test done.. In oral form of Glutathione, usually no investigations are required as compared to the injectable forms before starting the therapy unless you have a pre existing liver problem. If you are a healthy individual with normal liver function, you need not to get any tests done. The therapy can be taken safely. It's not mandatory unless you have some health issues. Hello. I’m Doctor for skin asthetic. If you going to take glutone, then no need to check blood. And this tablet give good results but should take with vit c. And at least for 6 month. Then you will get good results. the proportion of a drug or other substance which enters the circulation when introduced into the body and so is able to have an active effect. Glutathione is produced in a limited manner by the body... Hence we need to take the external dose to get good effects fast.. I don’t know the packet doesn’t mention about it and also on google some studies say that oral glutathione gets absorbed but nobody mentions about how much percentage. I am using this and I don't know bio availability. Can Feeding mother can take glutone and vit c tablets, is it safe for mother and baby? I have 9 month baby, so I please and request for all to reply. No not to be use by nursing women.Its written on the product. I will suggest not to take. No its not for you baby mother. Its not for safe feeding mother.. I would Suggest to go for doctors recommendation. There are some acids which create internal too. But how it will affect on 9 months baby. It’s a risk. So I personally suggest you to go with doctors recommendation. No! You can take after few months when you stop feeding your baby. NO. BREAST FEEDING MOTHERS SHOULD NOT TAKE SUCH TABLETS. BUT IF YOU ARE NOT BREAST FEEDING THAN YOU CAN TAKE THE TABLETS. Glutone is a superoxide which can interfere with growth of the baby .As such no studies are conducted on breastfed babies but it is advised to avoid glutathione during breastfeeding. No it's not.. You can take it when u stop feeding your child. Do I have to use this product for lifetime?? Not at all...as per my knowledge use it for 2-3 months until u get ur desired complexion....not more than 3 months. The results (if seen) will last as long as you take the tablets. I don’t recommend taking it life long. Ideally for glutathione to work, you should consume it regularly for atleast 3 to 4 months. Hii I think we will have to continue till desire results and after that for the maintenance we can reduce its dose with 500 mg in a day or later 3 days in a week. .
No... You should use it for 3 months and stop.. Further treatment should be under supervision of dermatologist. Does it have any side effects after long years? Especially for girls... In their pregnancy? No no side effects dont worry about this product its great antioxidant so chill.. please avoid if you are pregnant.. this is not for feeding mothers.. Taking glutathione long-term has been linked to lower zinc levels.you can take zinc suppliments. I am not a girl and hence cannot answer ur question. It is recommended to consult a doctor in such a case. Girls who are pregnant should not take it unless consulting with their gynaecologist...in normal circumstances it is very safe. No but do'nt use it in pregnancy time. Glutone, as you are aware offers, the world's best source of Glutathione, which is, SETRIA Glutathione from Kyowa Hakko, Japan. In Feb 2018, SETRIA has attained GRAS status from US FDA. GRAS status means, 'Generally Recognised As Safe'. Hence, it is expected that, when SETRIA Glutathione used in the recommended dosages for skin lightening, the product is safe for long term use. However, clinical studies of Glutathione for skin lightening have been done for duration of 12 weeks with good safety profile of Glutathione and other studies to determine blood levels for 6 months have also reported excellent safety. As regards use in Pregnancy, there has been no study done using Glutathione in Pregnant Women. Not enough information is available to determine if glutathione is safe to use during pregnancy and breastfeeding. Hence, it is advisable to always discuss this with your Doctor who will weigh the risk vs benefits and make a decision. How to use this one , and can i drink it when i am menstruating ? Yes! It has to be taken everyday empty stomach dissolved in 120 ml of water with 1000mg of vitC, irrespective of your menstrual cycle phases. Mix with vitamin C ,Ener C tablet both in one glass of water and have it after breakfast... You can use during menses. You just have to dissolve a tablet in a glass of water along with the vitamin-C tablet and drink it empty stomach.It is completely safe to drink it during the menses as I've been doing so and haven't faced any problem. 1 glutathione &1 vitamin c tab drop in 100ml water wait till effervescent dissolve completely with 2 min than drink. note- please take empty stomach at morning. please dont take if you are pregnant or feeding mother. Can i have this with hot water? I like hot water, so can i drink it with hot water instead of normal one? Use room temperature water. It doesn't have to be hot or cold. No it has to taken with room temp water. According to me use normal warm water ..
Do i need to get myself tested before start taking glutathione? I mean any type of laboratory test? Is this product available only in india? I m not sure about that! Though it’s marketed in India. Well all I know that I got it from India but I'm sure it must be available outside as well.Perhaps Micheal Jackson must have used the same to lighten his complexion ,who know????? .This product is giving obvious results now so I happy to continue. Please be patient and you will see the difference unfold. I believe you can buy it overseas as well. I used the tablet just 17 days ago, I heard that result we will see after 3-4 months. Let's see.. It is available in India and not sure about other countries. Ye you have to take both glutathione+vitamin c.
Yes, because qlutone work in combination of vitamin c. Without vitamin c it wont work. I have been using the tablets from last 15 days, again I have ordered a pack of 2, so as per the doses after almost 3 months should it be stoped consuming or it has to be maintained by Glutathione C, if yes for how long glutathione C has to be consumed. What we should avoid to eat when we are having this tablet? There is nothing as such that you are needed to cut off from your diet.What I do is only to take it on empty stomach every morning that means there should be atleast half hour gap before your breakfast. I dont know about this. Because i m personally not avoiding anything. About to complete 1 month. And m getting results. M happy bt its expensive. I dont hv any knowledge about this.i am on my normal regular diet. The tablet works well if you take it on empty stomach or with the time difference of two hours before or after meal. Well if you need quick results then it is advisable to eat healthy food. It is our poor lifestyle that results in poor skin conditions. Avoid spicy food, sugar, oily food and eat only home-cooked cuisines. Add a salad to all your meals as raw vegetables have more nutrition than processed food. Also, drink lots of water. can we take Vitamin C with these tablets..?? You have to take vitamin C with this. Yes... for best results we should take. Yes it's vital to take vitamin c tablets aling with Glutathione for better absorption of the same and consequently the effects are obvious. Please take both dispersible tablets for best results. Hope this satisfies your query. In my opinion...Yes..! Vitamin C is an antioxidant and therefore has its own skin lightening effect .. Yes definitely.. infact glutone 1000 will give you best results if you will use it with ener c 1000 . It is Vitamin C that will make you fair. Glutathione will only help in absorbing vitamin c and sustain it in your body for a longer time. So without vitamin C, glutone 1000 is worthless. Also due to Glutone 1000 your body goes in a state of Zinc deficiency. So you must prefer Escor-Z as it contains Vitamin C + Zinc. Do tablets contain sugar? Also has it been certified as safe by government for usage? Please consult a dermatologist and then start the treatment. this is only for vegetarians ? No, anyone can use this. If you're asking that tablets are for vegetarians then yes as you can see the green mark on the packet which indicates that the product is vegetarian. With glutone 1000 and ener c 1000 I think more effective. Ener C should be taken with glutone 1000, escor Z should be taken with gluton C.
Anyone is fine but for better results go for Escor-z. Is this pack is only for 15 days? Then for 3 months do we need to buy 6 bottles? Do we need to use ener c or escor z along with this? If yes which to use and what is the difference? Using of ener C is recommended Because, glutathione by itself cannot be absorbed into your system. And the best result can be obtained only when it is consumed in conjunction with vitamin C of any type. Ener c has only vitamin c and ener z has vitamin c and zinc .... When we eat gluton glutathione we have deficiency of zinc so it is necessary to take zinc supplement along with gluton..
As compared to other Glutathione brand why is Glutone Tablet so costly? Glutone is the only Glutathione brand in India to offer, ‘SETRIA GLUTATHIONE’, from the world’s No.1 source of Glutathione, which is, Kyowa Hakko, Japan. Besides offering the best source of Glutathione, Glutone is available in the widest range of - tablets, effervescent tablets and even in injectable form. Manufacturing of effervescent tablets requires special manufacturing facilities with controlled temperature and humidity conditions. Even the packaging for these effervescent tablets is unique with special tubes fitted with dessicant containing stoppers or caps that maintains the product quality. You will appreciate that to get such a product of international quality, we will be incurring some additional costs. Nevertheless, be rest assured that we are giving you the best quality Glutathione for unmatched efficacy and safety in Glutone. Thank you for your interest and support for Glutone. It's not costly! Compare with the other brands authentic dermatologists prescribe like epilight advance 1000mg; glutone has the almost the same price or lower! Secondly, it's an effervescent tablet, any effervescent tablet you'll find in the market costs more than the regular one's. With Glutone, will my whole body have skin lightening effects or only my face? With Glutone, you will experience skin lightening effect all over the body, with continued use as suggested. In Glutone, we are providing ‘SETRIA GLUTATHIONE’, from the world’s No.1 source of Glutathione, which is, Kyowa Hakko, Japan. It is recommended that, depending on your skin tone, you begin therapy with either Glutone 500 or Glutone 1000 and continue to take the product, in the dosage of 1 tablet daily for atleast 12 weeks. With this course of treatment, you will see a visible difference all over the body, from around from 4 weeks, which will continue as your treatment progresses. Thank you for your interest and support for Glutone. It will effect on whole body not only on your face. Even it’s start affecting the body first then to your face. Result is more on the body...but not much on my face. Whole body. But you have to be very patient to see the results. yes..u will definately notice results in 15days.. best product for skin lightening though it is costly but results are 100%..i highy recommend to use this product..
Are Glutone tablets better and safer than Gluthathione Injections? When used, as per dosage advised, both oral and injectable route of administration of Glutone are effective. Tablets are very simple and convenient to use and we have Glutone in a range of dosage to meet different skin tone needs. Injectable form gives higher levels in the blood and can cause local reactions at the site of administration. You can discuss with your medical practitioner as to which form is suitable for you. Thank you for your interest and support for Glutone. Glutathione injection has quicker result as it mixes with the blood directly but one cannot have injection daily as it has got very dreadful side effect as thrombosis which is very risky and one has to be very alert as there are many fake glutathione injections running in the market.So Glutathione tablets are obviously safer and easy to consume without having any risk. I am suffering from pigmentation. I mean on my fore head and cheeks having black patches. Can i use this? I have also got the same problem and for the same purpose I have started consuming these tablets of Glutone 1000 since 1 last month.Though the fingers and hands are gradually losing pigmentation but still on face I do not see difference in pigmentation. For that Lipoic acid and zinc should be added with Glutathione in the tablet for better result. Yes u can use this product to reduce pigmentation and patches. It will definitely cure your pigmentation however you have to use it for at least 3-4 months along with better sun protection. This tablet is taken by dissolving in water right, So along with this can we have any brand of vitamin C tablet which can take without dissolving in water? Or we should take vitamin C also which dissolves in water? Yes there are many brands of Vit C tablets like Limcee and C ZIN which can be consumed without dissolving in water but dissolved tablet can be absorbed better by the body. U can take EnerC1000mg / Escor Z which are Vitamin C water soluble tablets..
Vitamin C with 500 mg to 700mg is enough. Can i consume glutone 1000 tablet in hot water? It is before food or after food? I am drinking vegetables juice so can i continue after taking Tablets? And in the night i take Red wine is there any side effects from this tablet? It really doesn't matters even if you take this tablet with hot or luke warm water. However you must have it on empty stomach, preferredly in the morning, and you cannot eat or drink juices or wine for at least an hour after that glothione dose. Drinking red wine has nothing to do with this tablet. Not hot water but Luke warm water can be considered. It has to be consumed in the morning, empty stomach. Ya.. you can have the supplement first in empty stomach and then after a gap of 30 mins, you can have your vegetable juice. It's better if you pause the intake of red wine for a period when you're having these supplements. Good luck. No ,you consume glutone 1000 tablet in normal water.its before food only one tablet in a day .yes it's vegetables tablet ..its not a tablet its supplement without side effect it's safe .. Please take only with vitamin C only..
i take it in normal water which is neither hot nor cold in empty stomach in the morning. can drink vegetable juice or redwine like 30mins after drinking glutone. Can we use this tablet while breastfeeding? Is this permanent result..? Or we have to use it life long..? Hello, I am from United Kingdom. Please kindly tell me what is price this products in my country. I want to buy these tablets as my friends ordered last time from you. Product has great affects on my skin. Please help me with shipping. Hi its only glutone tab or including vitamin c tab also? To take this tablets our minimum age? If we stop taking the tablets than it stops working on fairer process? ?